The Ankylosaurus, or the ‘fused lizard’ was a dinosaur that was tank-like in appearance. Its upper body was heavily protected with an armor of thick and oval shaped plates that were within its leathery skin. This feature protected the Ankylosaurus from the contemporary carnivores. It had two rows of spikes along its trunk and large horns. The horns stood out from the back of its head. The Ankylosaurus had a tail that was club-like in appearance. Ankylosaurus were bird hipped dinosaurs and had bony plate like projections that protected the eyes. Other than its under-belly, its whole body was plated. It lived amidst the carnivores like the Tyrannosaurus and Deinonychus. The club shaped tail was a weapon of sorts used by the Ankylosaurus as protection from predators. Ankylosaurus was herbivore and diasid, which means that it had jaws set with socket set teeth. It sustained itself on huge amounts of plants that grew on low-lying areas. Its body probably featured a fermentation compartment like organ to help in the digestion of the plant material that was tough. The Ankylosaurus was between 25 and 35 feet long and stood at a height of 4 ft. It lived around 70 million years ago. The fossils have been discovered in Western USA and Canada, North America and South America. The Ankylosaurus was a heavily plated, four legged herbivore which originally emerged in the Jurassic period but spread rapidly during the Cretaceous, by which time it was flourishing in the northern continents and even as far south as Australia and Antarctica. Discovered by Barnum Brown in 1908, it was popularly referred to as the “fused” or “curved” lizard owing to its Greek roots ‘ankulos’. The remains of the ankylosaurus were discovered in different parts of North America, more specifically in the Lance Formation in Wyoming, Hell Creek aswell as the Scollard Formation in Alberta, Canada. 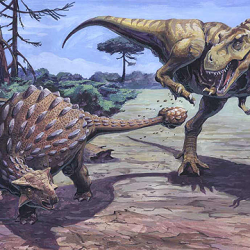 Belonging to the Ankylosaurid genus the Ankylosaurus only had one species the A. magniventrisare. The term ‘magniventris’ has a specific meaning and here it can be traced back to its Latin origins where ‘magnus’ refers to great or large while ‘ventris’ refers to the belly. Therefore the A. magniventris refers to the enormous extent of the ankylosaurus. All descendents of the ankylosaurid group are recognisable for their bony tail club and hugely armored body. In fact the ankylosaurus are considered to be symbolic of the standard armored dinosaur. The ankylosaurus was the largest of the ankylosaurids and measured anything from 20-30 ft long. With an extremely wide and bulky frame the ankylosaurus was the tank of dinosaurs in more ways than one. One of the most prominent features of the bone structure of the ankylosaurus was its tail club. The vertebrae of the tail region was formed as a series of huge osteoderms which are actually bone plates. These bone plates were interconnected with seven tail vertebrae joining together providing enormous strength to the base of the club. If enough strength and power wasn’t enought they also possessed several bony tendons which infused extra power to the tail allowing it to be used effectively as a defensive weapon. It’s thought that a single strike of the tail could break the bones of it’s attacker. While the tail club formed a significant part of the body of the Ankylosaurus, a further unique feature of it’s physical appearance were the body plates or the layers of osteoderms that covered its entire body. These plates formed an armor which added to the defensive strategy of the Ankylosaurus. The head and skull of the Ankylosaurus was more or less triangular in shape and much wider compared to its length. This structure is common for herbivores who mostly fed from the low lying vegetation on the ground and not from the high branches of trees like those of the Corythosaurus. Like most herbivores the ankylosaurus possessed small leaf shaped teeth which were suitable for chewing. No specialized grinding teeth were found which provides evidence that there food type was limited to foods that were easily chewable.